Photo by Bill Gravatt. Read Bill’s AMP review HERE. Our good friends Ed and Steve (aka “The 6.5 Guys”) have just released an in-depth product review of the AMP Annealing system. Produced in New Zealand, the AMP (Annealing Made Perfect) unit is a sophisticated, microprocessor-controlled annealing machine that achieves ultra-consistent results through an electrical INDUCTION process. Photo from AMP Annealer Review by Bill Gravatt. If you want to extend the useful life of your precious cartridge brass, then you should definitely consider annealing. 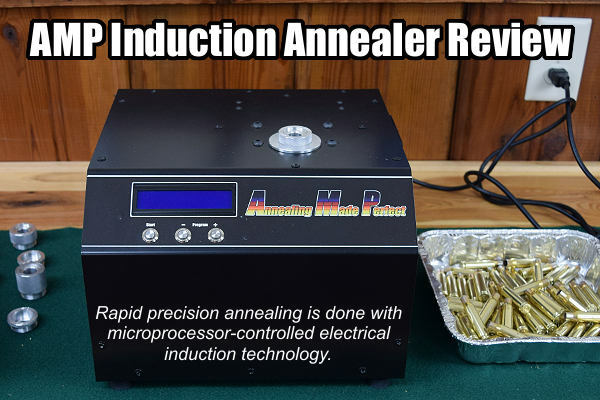 And if you are in the market for an annealer, the new AMP machine deserves serious consideration. Though not inexpensive, it achieves excellent results according to the 6.5 Guys. 1. The AMP machine provides complete peace of mind that you are annealing properly — there is no guesswork. With a propane machine you have to calibrate dwell times which can be error prone. Even if you don’t change out your cartridge, dwell times will vary with temperature changes as this affects the propane pressure. 2. We noticed that the AMP machine produces brass that is more like factory brass from a hardness standpoint. 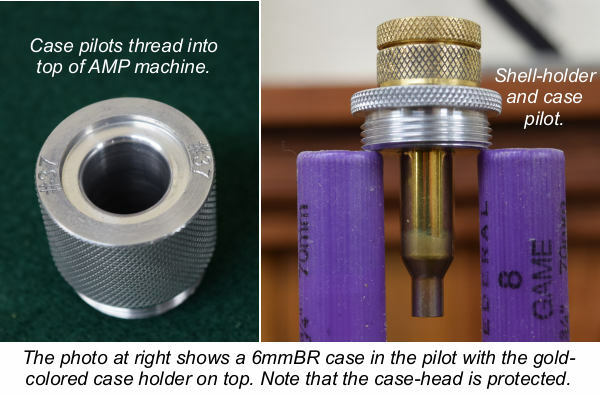 Despite all our efforts and research around calibrating our propane machines, brass never seemed returned to factory condition and shoulder spring-back would increase with each reloading so we had to adjust our sizing dies. When a cartridge comes out of the AMP it is very, very close to new condition. 3. One of the things we dreaded was setting up our propane machine for different cartridges. With Ed’s OCD he would spend a good 30 minutes making sure everything was perfect. With the AMP machine you simply change out the pilot and select the proper program. It’s really straight-forward. NOTE: We strongly recommend you read the Full AMP Annealer Review on 65guys.com. It contains a detailed explanation of the machines’ operation and the reviewers explain the pros (and cons) or the machine compared to flame-type annealers. The current price for the AMP Annealer, with three pilots of your choice, is $995.00 USD. Additional pilots are $20.00 USD. For more info, visit www.AMPAnnealing.com. Share the post "6.5 Guys Review of AMP Induction Annealer"